$25 Can Reduce Your I.T. Stress - Advanced Computers Blog | NY | Advanced Computers, Inc. If you depend on technology to maximize the efficiency of your business, you may have had your fair share of horror stories, including downtime brought on by computer or network problems. Nobody wants to be stressed but when business owners who try to save on their IT spend are unable to fix the problem themselves, stress creeps in. You wouldn’t call a plumber to come in and fix your car right? Not that there aren’t some tech savvy people who can fix many things but IT issues are best resolved by IT people who know what to do, to not only resolve but to prevent recurrence of that problem. Small businesses that try to resolve IT issues themselves may pay a bigger price than the cost of an IT specialist, that is, loss of revenue and significant downtime in production hours. Outsourcing your IT needs to a managed services provider is therefore a smart investment and it doesn’t need to be expensive or frustrating. When you hand over the management of your IT systems to a managed services provider, you eliminate the need to worry about losing valuable production time trying to be a jack of all trades when computers and networks fail. It is always better to prevent the problem rather than having to constantly react to it. Advanced Computers managed IT services can help eliminate your company's technology-based headaches, starting at just $25 per computer per month. That’s less than half of the fee you are likely to pay for a doctor’s visit if you’re stressed. Here’s why your business should consider using a managed services provider like Advanced Computers, https://www.advancedcomputersinc.com/it-services/managed-it-services to take care of your IT needs. With our highly affordable managed IT services, you will never have to worry about the expense of repairing a network or workstation problem again. 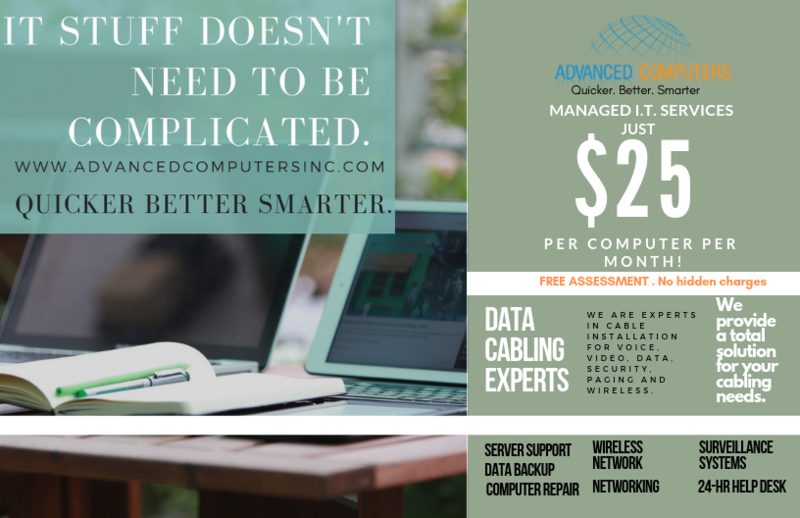 Advanced Computers provides multiple IT services to help your business increase efficiency and deliver the peace of mind that goes hand-in-hand with optimal uptime. We can help put you in a position where your technology issues won’t stand in the way of your company’s profitability. These services are provided to you on a flat-rate, easy-to-budget plan, based on your needs. This results in value for you. No matter how costly the resolution to a technology-based problem is, you still pay a flat monthly fee. This allows what would normally be a capital expense, to become an affordable operational expense. We eliminate surprise computer repair costs that will invariably result in more attractive numbers on your bottom line. We don't have to stop what we’re doing to resolve your IT problems. Chances are, we've prevented them from happening. Using us as your complete IT technician can allow the people that make your organization run, be able to work without interruption from technical issues that plague less efficient companies. Our monitoring and maintenance services provide companies with avenues to be more efficient and exceed projections, which often leads to the potential for rapid growth. As an Advanced Computers partner, you'll experience efficient and high-quality IT consulting and support. To top it all off, Advanced Computers will give you 2 free hours of service FREE, to show you that there is a better way to solve those day-to-day I.T. issues that plague businesses of all sizes. If you don't have an issue for us to resolve right away, that's fine; use your 2 free hours to have us run a full audit on your network infrastructure and map out any weak points, finding issues before they even occur. That's the Advanced Computers Difference; proactive maintenance to prevent downtime. We don't wait around for things to break; we keep your business up and running all day, every day. Why experience a loss in productivity or get slammed with high computer repair bills? We want you to expand and grow. Ready to reduce your stress levels and save while you are at it? Take a moment to fill out the form https://www.advancedcomputersinc.com/free-consultation for a FREE consultation or give us a call at (212) 532-9500.